The torch is a the portable device which can provide long and intensive burning of fire in the open air under various weather conditions. During movement of a column fire will be transferred together with the torch from a torchbearer to a torchbearer. Main advantage of the torch of the Universiade is a laconic appearance and ideal technical component. Producers – the Australian company FTC Flame guarantees steady and bright burning of the torch under any climatic conditions. 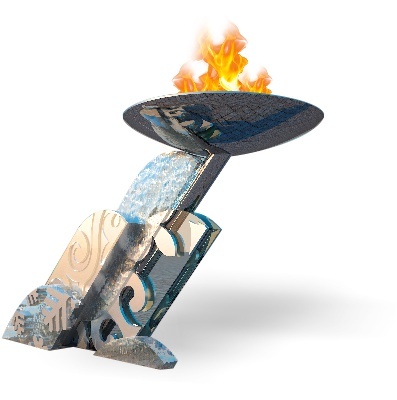 FTC Flame has provided technical assistance of the Olympic Games since 2000, in 2013 delivered a cauldron of the Games on the Universiade in Kazan, in 2014 developed burning elements for the Olympic Games in Sochi and the European Games in Baku. Experience is a guarantee if quality and reliability of torches. The directorate of the Universiade made a choice of the high-quality, easy torches which are steadily work in the conditions of the low temperatures giving a bright steady and safe flame of saturated scarlet color. The device is intended for transportation, delivery, transfer and storage of fire. A distinctive feature of a transport flask is safety, reliability in operation, and the technology solutions of a design allowing to achieve safety of fire throughout a long time and in any weather conditions. The device has the following advantages: usability, high reliability and maximum practicality. This modification is a classical device which is traditionally used for transportation of Olympic Flame from Greece to the venue of Fire Relay. In similar flasks Fire of the Olympic Games traveled in London, Sochi, Rio. Exactly in such flasks fire will be stored throughout all the Universiade in a storage of the partner bank. If the torch or the main bowl of games will go out, fire will be recovered from a flask with maternal fire. 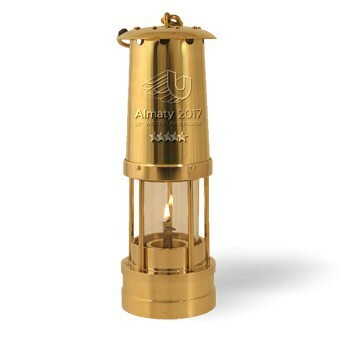 At the heart of the transport flask is the well-known Davy lamp – a safe miner’s lamp in which a copper grid with small openings warns a possibility of distribution of a flame from internal space of the lamp to a mine atmosphere. The company producing lamps was founded in 1860 by Evan Thomas in the South of Wales, and continues to work up till now. The city cauldron has corporate stylistics of the Universiade. The stylized wings are a basis of the cauldron. The design is a hi-tech style and completely repeats design of the main cauldron of Games set at ice stadium Almaty Arena where on January 29 the Universiade opening ceremony will take place. 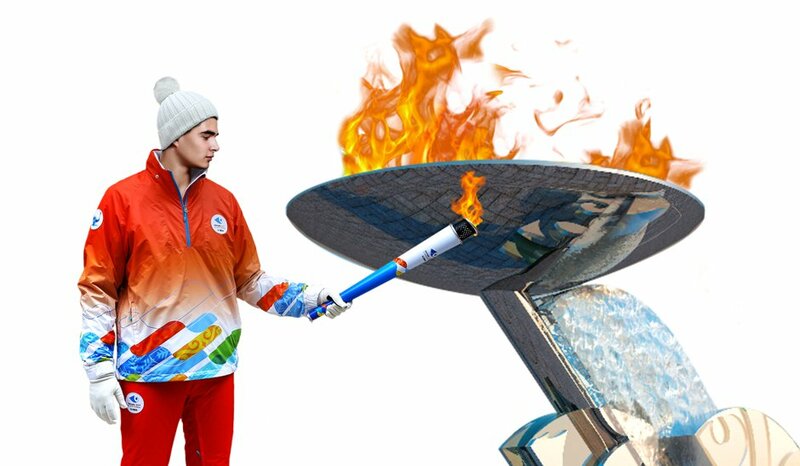 Exactly in the main cauldron throughout all the Universiade the Games Fire will burn from January 29 to February 8. 1,000 torchbearers aged from 17 up to 28 years old will participate in the Relay. Also eminent persons of sport, culture, science, representatives of FISU will be among torchbearers. The main condition of participation in the competitive selection – at the time of the Relay carrying out a torchbearer shall be a student of a higher education institution of a region of any form of education. It is also offered to each higher education institution of the country to make own selection the result of which will be a forming of the list of ten best students. Having studied lists of all educational institutions, a council of rectors of each city will make a decision, having selected the most worthy. Criteria are simple: active living position, achievements in sport, science. Each participant of the Relay shall have a history of a way to success. History which will be interesting not only to Kazakhstan citizens, but to billions inhabitants of the planet – such will be the Universiade television audience. Everyone corresponding to selection criteria can independently fill in a request for participation in the competition posted on the official site of the Torch Relay. The decision on participation will be made by regional screening committees. The results of the competition will be summed up on December 16, 2016. 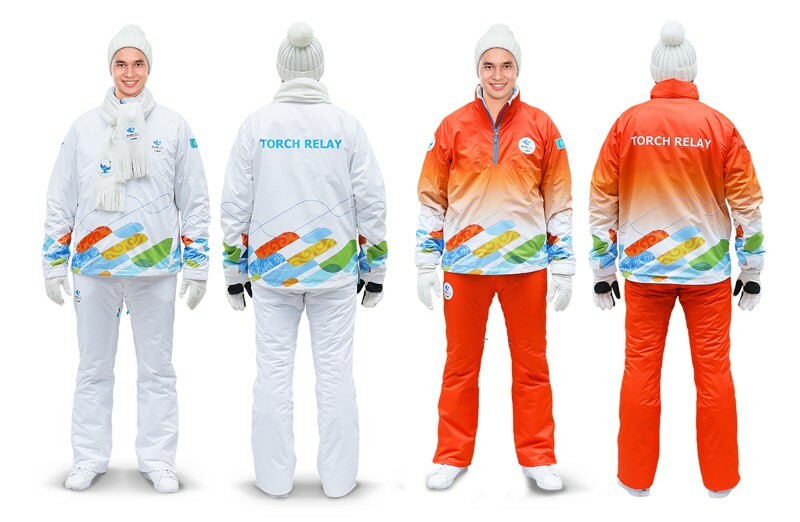 Lists of torchbearers will be available on the Universiade website. 16 best representatives of regions will become torchbearers of the final stage, and will take part in Universiade Fire inception at the opening ceremony of the Games. To prepare – 16 subsections on the cities. Each has the list of 60 people with the description of achievements. The lists of torchbearers will be published on December 16, 2016.